I’ve finally gotten round to improving some cheap storage bobbins I got for about 10% of the price of spinning bobbins. A bit of vetwrap which I had anyway and two cardboard discs, they work fine for transferring singles onto if you don’t feel like plying straight away. I use my wheel to move yarn between bobbins, and since the weaving bobbins don’t have a groove for the driveband, I needed some traction. The wrap wasn’t enough however so I tried various rubber gromets. I also needed to come up with a solution to the fact that they don’t fit on the flyer shaft, so I found the one remaining welding rod from the hackle project, some more gromets and and Bob’s your uncle! You need to use a single driveband for this size groove, or it jumps out. And tape the radial cuts in the discs to prevent the yarn getting stuck. 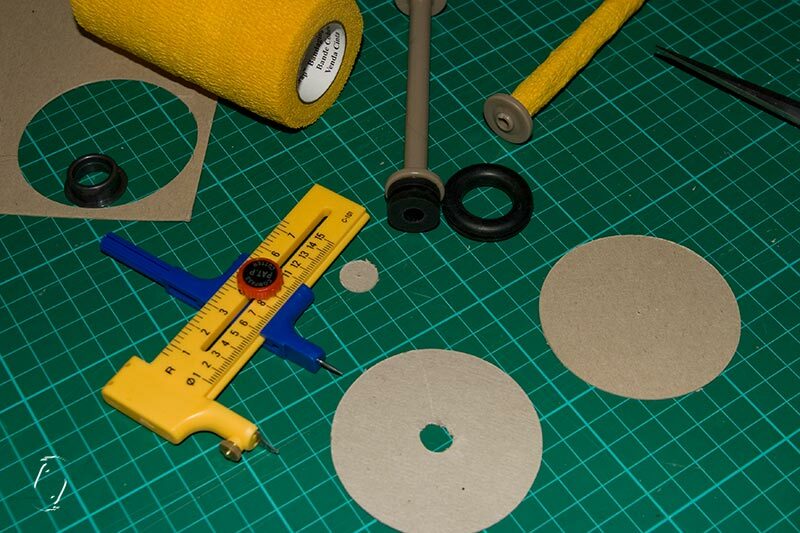 The circular cutter worked like a charm too, I saw it at a hobby shop and just had to get it – didn’t cost much either. Jeg fandt ud af, at det var bedst med en enkeltsnor, ellers hopper den ud af rillen, og revnerne i papskiven skal tapes til, ellers sætter garnet sig fast eller ryger ud på ydersiden. That is very clever! Did you already have the weaving bobbins? Where do you find those? These are Ashford bobbins which I got the same place that sells supplies for my Ashford wheel, but there are other brands. You can also get cardboard tubes. So any place that sells looms should have them.